LOS ANGELES – With a growing number of incoming students from all backgrounds, the University of California has tried to accommodate future learners with a diverse, well-rounded education suitable to their needs. For us Filipino-Americans, higher education has always been a top priority, to fuel our drive for success. However, the reality is that fewer and fewer young Filipinos are joining the UC education system. 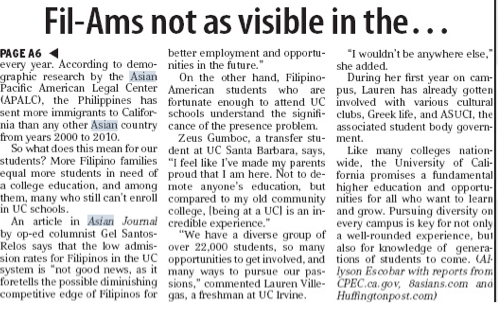 Despite being the largest Asian American/Pacific Islander group in California, Filipinos are still hardly present in the grand total of Asian Americans that are supposedly “taking over” the various campuses, especially in big-name schools like UCLA, UCSD, UCI, and UC Berkeley. While Asian American students practically dominate these bigger schools (for instance, 50 percent of undergrads at UCSD are Asians), Filipinos themselves are not as visible. In a 2010 student snapshot of data by the California Postsecondary Education Commission, it’s estimated that Filipinos have the lowest rate of total undergraduate/graduate campus enrollment, compared with other Asian ethnicities. In UC Santa Barbara, for example, only 590 Filipino students were enrolled in Fall 2010, in contrast to the 3,246 non-Filipino Asian Americans admitted that same year. There are many known reasons for this sudden dip in Filipino resence. Take a look at Prop 209. An article in blog site 8asians.com talks about the proposition (also known as the California Civil Rights Initiative), which prohibits the government from considering race, gender, or ethnicity in making decisions for public education or financial aid. “The percentage of underrepresented minority students admitted to the UC system dropped significantly, as soon as Prop. 209 passed,” said the San Francisco Huffington Post. Filipinos, who are often caught in the middle of financial aid problems and affirmative action, play an active role in this debate. In years past, Filipinos were among the only Asian Americans considered for affirmative action in the UC system. Now, with the passing of new laws and Prop 209, many Filipino families have had more trouble getting their children to “better” (and consequently, more expensive) schools. As a direct result of the passing of Prop. 209, the number of Filipino undergraduates across all UC campuses decreased significantly. Applications for graduate and professional schools also went down, and a report even indicated that the law school at UC Berkeley admitted no Filipino students that year. It’s no wonder that with rising costs, many Filipino families are uneasy about sending their children to a university. Last year, Gov. Jerry Brown promised a steady budget plan to try and avoid tuition increases for school year 2013-2014. Of course, this meant a new initiative to raise taxes. But the tuition would remain fairly the same. California, by itself, is prized for its budding racial diversity. The number of Filipino-Americans alone continues to grow ever year. According to demographic research by the Asian Pacific American Legal Center (APALC), the Philippines has sent more immigrants to California than any other Asian country from years 2000 to 2010. So what does this mean for our students? More Filipino families equal more students in need of a college education, and among them, many who still can’t enroll in UC schools. On the other hand, Filipino-American students who are fortune enough to attend UC schools understand the significance of the presence problem. “We have a diverse group of over 22,000 students, so many opportunities to get involved, and many ways to pursue our passions,” commented Lauren Villegas, a freshman at UC Irvine. “I wouldn’t be anywhere else,” she added. During her first year on campus, Lauren has already gotten involved with various cultural clubs, Greek life, and ASUCI, the associated student body government. Like many colleges nationwide, the University of California promises a fundamental higher education and opportunities for all who want to learn and grow. Pursuing diversity on every campus is key for not only a well-rounded experience, but also for knowledge of generations of students to come.